The Severn Challenge is a unique BB event that runs every other year. The River Severn is Britain’s Longest River at 220 miles long, rising in the Cambrian Mountains in North Wales it enters the sea at the Severn Estuary, West of Bristol. The river is traditionally navigable from Pool Quay near Welshpool to where it joins the sea. Over the years the river which now has little commercial traffic has been allowed to go wild. Many of the original man-made features have been allowed to collapse and many of the trees and other obstructions that find their way into the rivers upper reaches are often not cleared. At Telford the river passes through the world famous gorge at Ironbridge, where some years ago boulders were dropped into the river to create a stretch of grade 2 rapids. 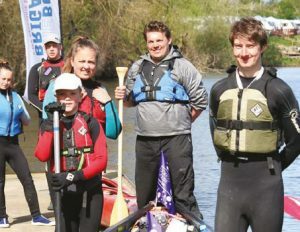 The Challenge is for young people either in teams or as individuals to cover 107 miles of the River Severn in seven days. This year young people and leaders from Companies in Somerset and Oxfordshire took part in the week-long challenge.